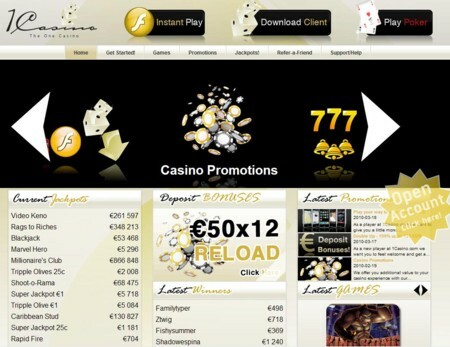 With its cool and elegant home page, exotic interface, and player-friendly features, 1Casino is one online gambling hotspot that you cannot afford to miss out on. The casino not only looks good, but also has a great range of games and some exciting promotions to make playing the games available here an interesting proposition. 1Casino is owned by MCP Entertainment, a limited liability company registered in Malta. This casino has been around since the year 2004 and is licensed and regulated by the Lotteries and Gaming Authority (LGA) of Malta. The casino brand has been licensed to a Maltese company called Heptalon Trading Ltd. This casino does not accept US players. 1Casino runs on software developed by WagerLogic Limited, a well-known name in the online gambling software development industry. The software is robust and available for download to your computer. You also have the option of playing the games available directly from a browser using the Instant Play version. The WagerLogic software provides 1Casino with a number of exciting features. The graphics and animations are fantastic, as are the sound effects. Other cool features include smooth functionality, easy and quick downloads, the ability to check your play and transaction histories, excellent game range and promotions, multi-table play, and much more. 1Casino has a fantastic array of games. These include table games, card games, slots – classic and video slots, multiplayer games, video poker, casual games, and also specialty games. A number of the games are available as progressive jackpots at this casino, making the entire experience of playing here doubly exciting considering the big money that is associated with progressive jackpots. There are some cool promotions at 1Casino for both new and existing players. The casino offers a 100% welcome bonus up to €150 for newcomers. The casino also offers a 50% reload bonus up to €50 every month. Apart from these bonuses, there is also a €15 referral bonus for each friend you refer to the casino. The casino also offers updated promotions to players on a regular basis and the chance to earn comp points. You can check on these promotions by visiting the Promotions page on the casino’s website. All transactions at 1Casino are processed securely through the ECash Direct e-commerce application. The casino accepts payments through any one of the following methods – credit cards, debit cards, NETeller, MoneyBookers, Click2Pay, PaySafeCard, checks, wire transfers, SEB, and also drafts. At 1Casino, security is not something you should be worried about as the casino employs the latest in online security technology to ensure a secure environment for your personal details and transactions. Security methods employed include 128-bit SSL encryption technology. The casino also has stringent provisions in place to ensure fair play and also to prevent underage gambling within its portals. You have to be over 18 years old to play at this casino. 1Casino offers excellent customer support through a team of efficient and knowledgeable customer support executives. You can get in touch with a member of this team 24×7 through e-mail or telephone. You can also check the FAQ page at the casino before contacting customer support.